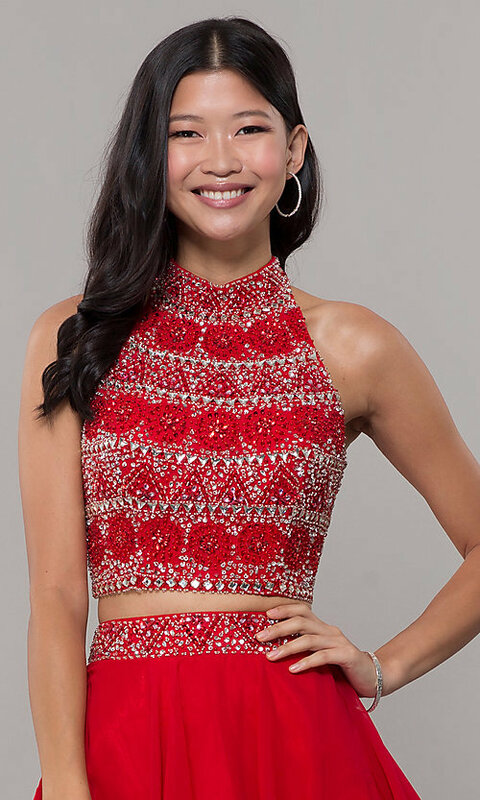 From the designers at Blush, this two-piece homecoming dress is a fusion of whimsical style and dazzling beadwork. 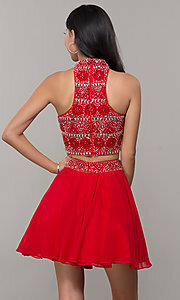 The stylish short party dress features a fabulous beaded design on the high-neck crop top and matching waistband of the short chiffon skirt. Diminishing the need for jewelry, the bodice has a beaded collar that attaches at the t-back detail, while cut-in shoulders add to the sporty look of this shimmering semi-formal dress. 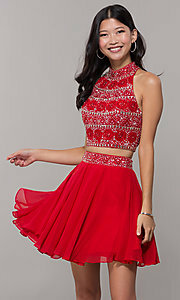 Fully-lined to add volume, the short chiffon a-line skirt flares away from the hips for a fabulous silhouette. A sparkling option for hoco 2019, sweet-sixteen parties, and holiday celebrations, this eye-catching two-piece homecoming dress is an up-to-the-minute fashion favorite with youthful style.